After the Second World War, the City University undertook a program of dramatic expansion that included the opening of several community colleges that would expand access to higher education to heretofore unreached groups. 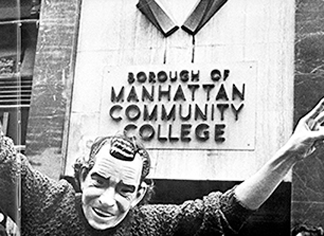 In keeping with this imperative, the Borough of Manhattan Community College (BMCC) opened in 1964. Originally intended to prepare students to enter business school, this idea quickly succumbed to the power of events, as students by-and-large refused to enter business administration, favoring the liberal arts. Moreover, changes in the composition of the student body that would be dramatized in the 1969 struggle for open admissions had begun to affect BMCC by the latter part of the 1960s. Faculty found themselves confronted with new kinds of students—working-class students of color who not only demanded access to the city’s institutions of higher education, but also that those institutions reflect the struggles they faced as oppressed minorities within the city and the country at large. Soon BMCC was a hotbed of radicalism, as groups like the Third World Coalition, together with radical faculty members, sought dramatic changes in the structure of their institution and its relationship to the world outside. This collection was curated by Bill Friedheim and Jim Perlstein who also saved and contributed the items. Jim was faculty advisor to the Third World Coalition and a participant in many of the struggles over curriculum, administration, and student participation in the running of the college. Bill Friedheim headed the college’s chapter of the United Federation of College Teachers (UFCT) and edited several radical publications that advocated alliances between students and radical faculty. Both were arrested along with dozens of students in the 1970 student strike and building takeovers, where students demanded an end to increases in tuition fees and a day care center for children of students, in addition to broader demands such as an end to US aggression in Southeast Asia. Go to all 51 Items in collection.